Backgrounds and other stuff from Koepi not fitting on the www.koepi.info webpage. 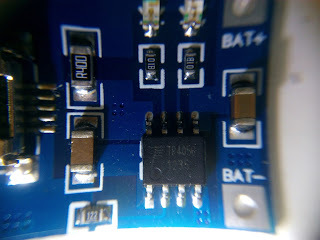 When playing around with my DIY Volt-Ampere-meter for inspecting chargers I stumbled upon a serious issue with my clone/fake TP4056 LiIon charging ICs. While in a first test without measurement equipment attached a battery came out with 4.175V, upon closer observation with a shunt-based current meter the voltage climbed up to over 4.4V. I remembered that in my first fast test I used a protected battery which obviously cut off the cell before overcharging it. 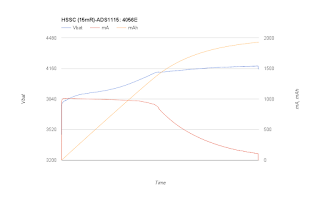 So I decided to plot the graph of the charging curve of this IC. Upon plugging in the charger the voltage immediately jumps up to over 4.4V. This is not yet the real voltage which I can measure directly on the battery, but still is weird. At the end I unplugged the charger, you can see the cell voltage drop to acceptable ranges. Just out of curiosity I plugged it in again to see if the IC just needs a little time or help to properly end the charging cycle. But it didn't help. Although I can measure zero current on the high side shunt, the voltmeter on the USB plug shows more than 500 mA flowing at 3,5W. Original TP4056 on a commercial PCB. To double check if the TP4056 is incompatible with measurements via shunt I took a commercial PCB from eBay with the original TP4056 IC with the correct logo and charged the same battery after discharging it ~380mAh. So this was a controlled experiment. The graph looks way better! 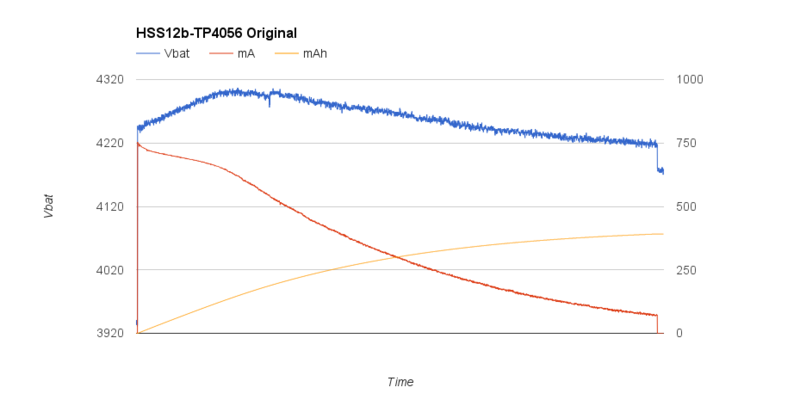 Charging curve of the original TP4056. The voltage rises up to 4.3V during charging, but the original TP4056 decreases the current sufficiently to not overstress the battery. A proper charge end adds to the positive image of this IC. The only difference between the commercial layout and my DIY PCB is the optional R400 resistor at the Vcc connection. According to the datasheet, this is optional, so I didn't populate it. I added a 0R47 and restarted measurements. Adding a R47 to the Vcc input of the fake TP4056. It helps the huge jump of the cell voltage at the beginning of the charge cycle. An hour later, I measured the cell directly with a multimeter and immediately unplugged the charger. 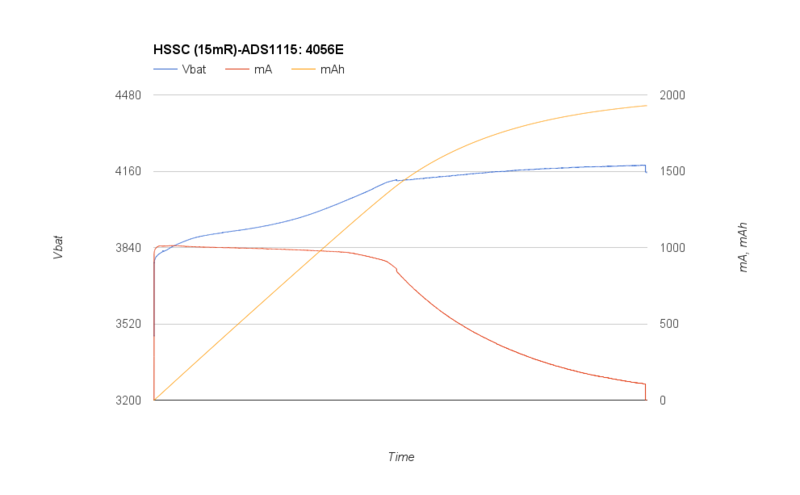 As can be seen in the graph, the cell has been charged to 4.4V already, although the measurement via shunt shows no current flow anymore. 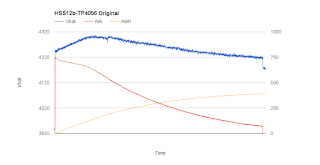 I am not the only one observing weird behaviour of cloned TP4056s - after researching a little on the issue I found other reports as well. Update 09.07.2015: I received another batch of cloned TP4056 - the seller advertised with the original photo, but delivered ICs marked with "4056E". I built a PCB with it. At first, the charger started off with 1.3A charging current. I stopped manually at 4.20V. When I checked, the charge current program resistor wasn't properly connected and delivered 4 MOhms instead of 1.2kOhm. 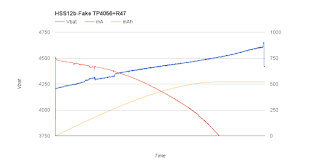 So not all clone TP4056 ICs are bad, some work correctly. The ones with a chip marking "TP4056" without that "F"-resembling logo are flawed, the original ones and the 4056E version are ok.
Nice write up. I really like the 4056E charging profile; smooth and steady. May I have the link to seller? Can i have the link for the genuine TP4056 please ? Unfortunately, for those pre-built original PCBs, the link is quite outdated and doesn't work anymore; it's from before 2013! Thanks, i wanted to order them but the link is dead again. der Beitrag ist lediglich als Warnung zu verstehen: Kontrolliere die Akkus während und nach dem Aufladen wenigstens ein mal, ob dein IC das korrekt macht. Es gibt eben welche, die das nicht können, und dann wird es gefährlich. Von daher scheint bei deinen Bausteinen alles in Ordnung zu sein. How did you mesure the voltage current ? with a oscilloscope ? 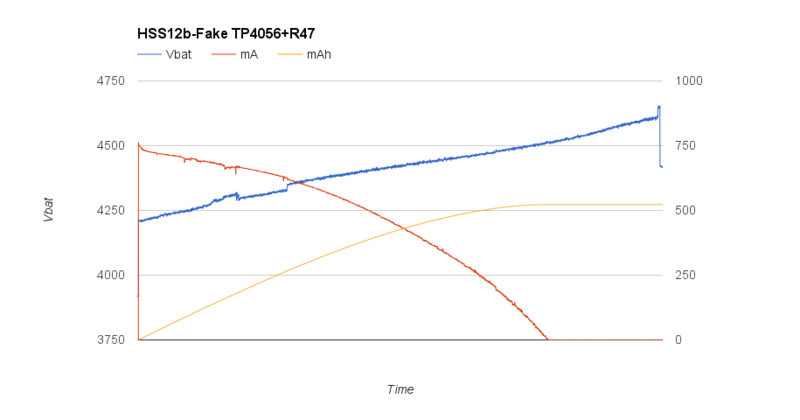 I'm looking for real tp4056, any links ? I built myself a volatge/current monitor with an ATmega328, a 10mOhm shunt and an ADS1115 16bit ADC. This is quite precise for measuring the voltage and the current flowing. 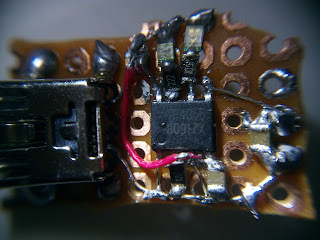 http://blog.koepi.info/2015/06/closer-inspection-of-few-chargers.html - scroll down a bit in that post to find some fine charging ICs inspected.